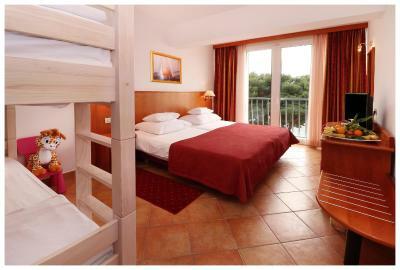 Lock in a great price for Hotel Zora – rated 8.1 by recent guests! 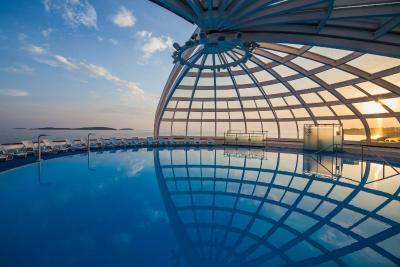 The location is the best thing about Hotel Zora. 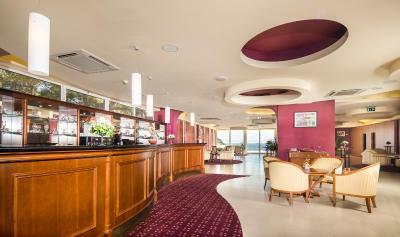 It is right on the beach that stretches around a peninsula on which the hotel is located. 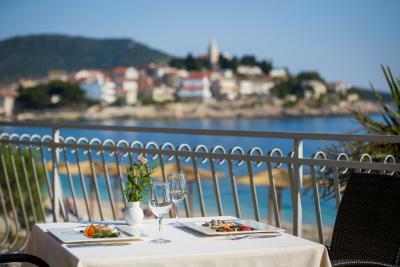 It is also a short walk from the heart of Primosten with its many restaurants and beautiful sights. The bedroom was clean and a good ceiling fan combined with the open balcony door kept us cool at night. Our room deal included a breakfast and dinner buffet. 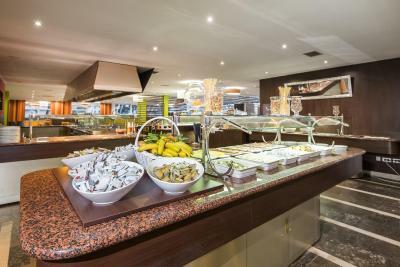 The breakfast buffet was excellent, with all the usual selections (cold and hot breakfast) and we made use of it every day of our stay. The dinner buffet was also adequate, although I expected a greater selection of fish given the hotel's location. 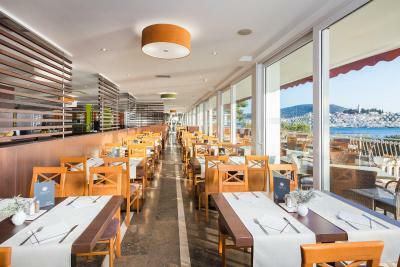 The dinner buffet idea, which I thought was a good one, is to highlight the cuisine of a different region of Croatia on each night of the week, but on the two nights we ate there, I couldn't see a significant difference in the selection of the dishes. Great food, nice place and people and great location. Premier club suite was clean and warm (we stayed in October). Bed was comfortable. Wonderful view (sea and beach side). Pool was warm and clean. Food was tasty and delicious. Great coffee in hotel bar. Staff was friendly and pleasant. Very good location and view. Swimming pool is great solution for days when it's cloudy and later sunny. Great accomodation, food, staff, and the town. 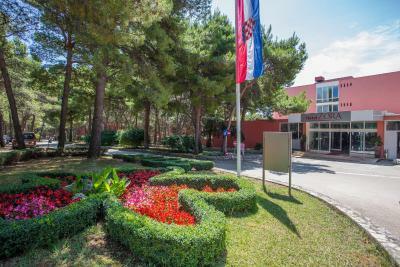 It is a great place to spend vacation with children! Amazing location. The beaches were great, not too busy. 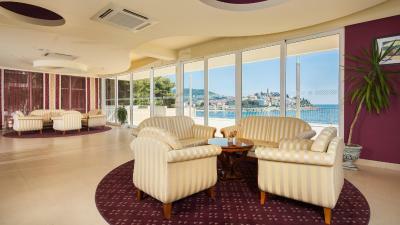 Close to the marina at Primosten and walking distance to the restaurants. Entertainment at the beach bar each night was good. View from the room (5202 with walk out balcony above bar and restaurant) was great. This place is suitable for couples (no kids) who can spend all day at the beach then go out to the bars at night for food and drink. For anyone else read on. Staff- excellent! Everyone was friendly and helpful. Food was pretty good as well, though we explored other local fare in the surrounding areas. Hotel is on an absolutely beautiful location. 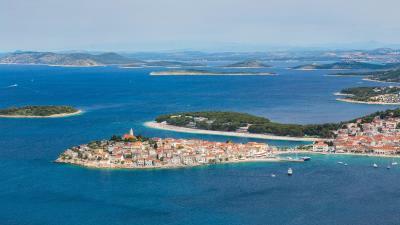 The whole peninsula seems to belong to the establishment, covered by pine trees and surrounded by beaches. The peninsula of the old city is a very short walk away. Several bigger cities and locations, ready to explore, are within short driving distance. The beach in front of the hotel. 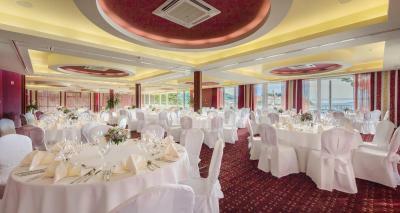 Located only a short walk away from the Primosten old town. The location is excellent, very close to the small old town, and beautiful beaches are around. Sea is crystal clear. You can always find shadow, there are lot of trees around the Hotel and near the sea. We always left our stuff on the beach while we were away and nobody touched it. The room was big enough. The food was great, there was every day some fish, chicken, pork, vegetables, fruits, cakes etc. There is a Consume supermarket in a few hundred meters. The location of the hotel is excellent. It is directly on the wonderful beach. Sea is very clean, the array of sunshades are well planned. Even there is a lot of people on the beach it isn't crouded at all. You have a lot privacy. There is the most beautiful sunset you can imagine. Hotel Zora This rating is a reflection of how the property compares to the industry standard when it comes to price, facilities and services available. It's based on a self-evaluation by the property. Use this rating to help choose your stay! 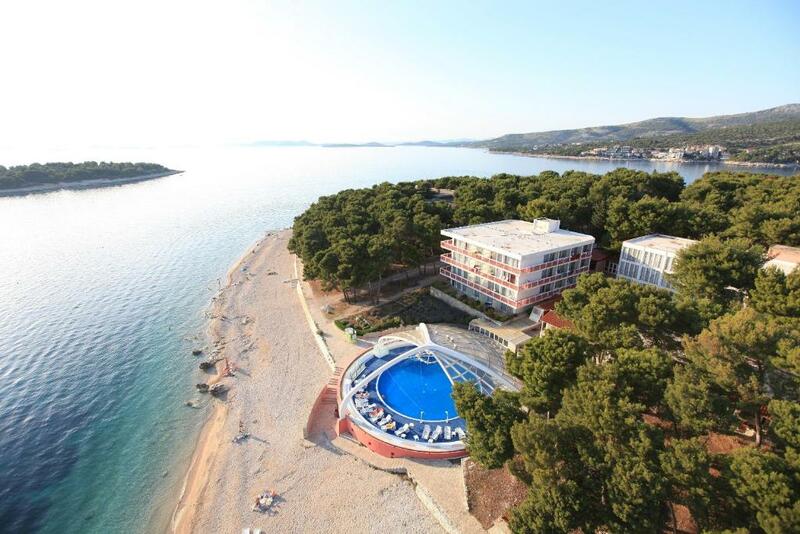 One of our top picks in Primošten.Hotel Zora is located at the tip of the peninsula, directly at the sea, surrounded by pebbly beaches followed by a path that goes for 2,650 feet through thick pine trees. 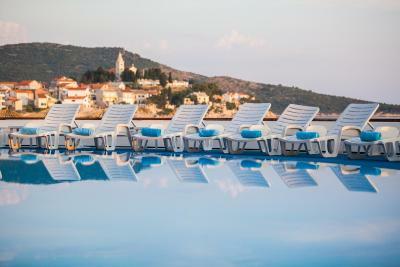 Only 1,650 feet from Primošten's Old Town, it offers a restaurant, tennis courts and a spa & wellness center with pools. 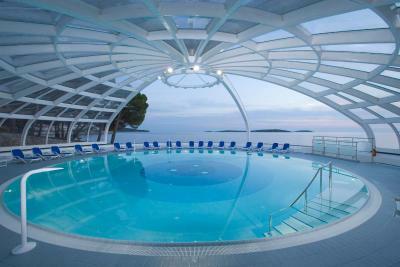 The hotel features 325 rooms with balconies, side sea view and and satellite TV, a restaurant and a swimming pool covered with a dome which can be partly opened, filled with heated sea water. 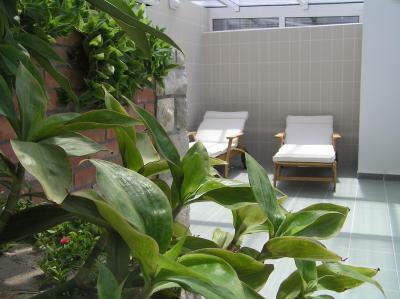 Under the same roof there is a sauna, a massage room and cosmetics treatments room. 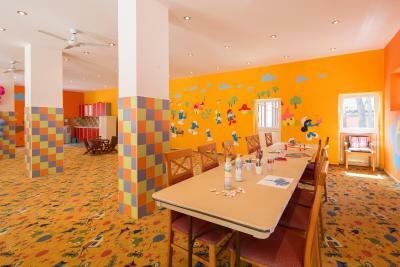 Guests can also enjoy the hotel's kids' club, as well as the gym and various sports facilities. 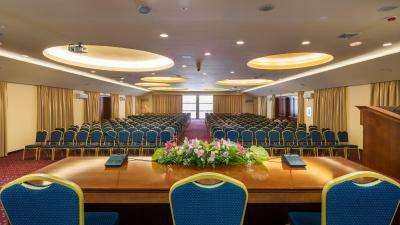 The hotel's front desk will gladly help with organizing excursions, car rentals and transfer services. 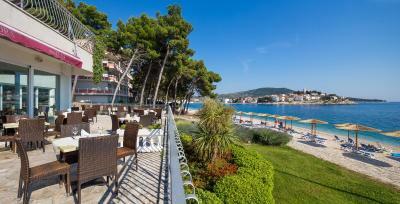 This is our guests' favorite part of Primošten, according to independent reviews. When would you like to stay at Hotel Zora? 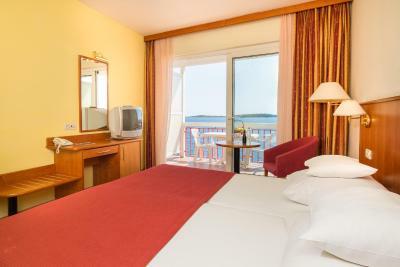 This 4-star air-conditioned room comes with a balcony, satellite TV, a fridge and a safe. 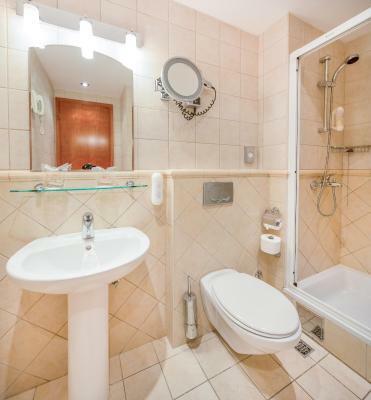 The bathroom includes a bathtub and a hairdryer. Free WiFi is available. The rate includes complimentary ironing service only on arrival day until 20:00 (2 pieces). Large 4-star air-conditioned suite with a balcony, satellite TV, DVD player, a bathroom with a spa bath, a fridge and a safe. Free WiFi is available. The rate includes a complimentary ironing service only on arrival day until 20:00 (2 pieces). Air-conditioned room with either a balcony or a terrace, and satellite TV. 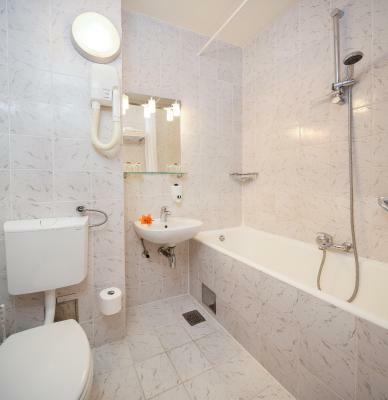 The bathroom features either a bath or a shower and includes a hairdryer. Free WiFi is provided. A 4-star air-conditioned room with a balcony, satellite TV, a fridge and a safe. 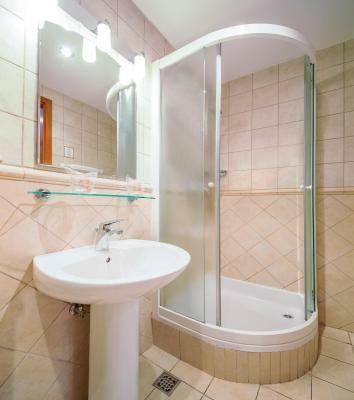 The bathroom comes with a bathtub and a hairdryer. Free WiFi is available. Air-conditioned room with either a balcony or a terrace, and satellite TV. The bathroom features either a bath or a shower and includes a hairdryer. 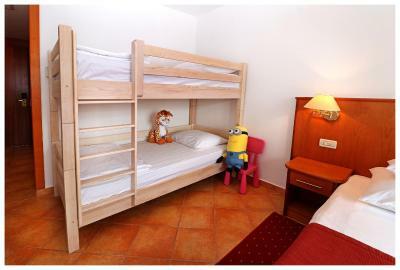 Featuring free WiFi, this single room features air conditioning, satellite TV and a mini-bar. The room has a french balcony. 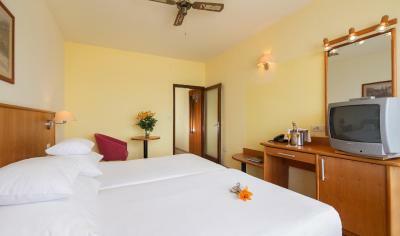 This 4-star, air-conditioned room features satellite TV, a fridge, a safe and free WiFi. The bathroom comes with a bath and a hairdryer. The room has a french balcony. The price includes free ironing service until 20:00 on the day of your arrival (for 2 garments ). This 4-star air-conditioned room comes with a French balcony, satellite TV, a mini-bar and a safe. The bathroom includes a bath or a shower and a hairdryer. Free WiFi is available. 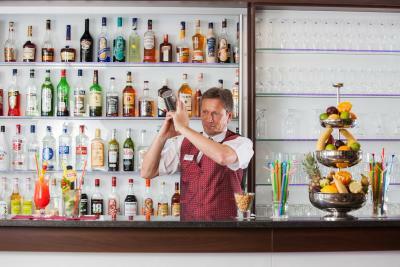 House Rules Hotel Zora takes special requests – add in the next step! Hotel Zora accepts these cards and reserves the right to temporarily hold an amount prior to arrival. Please note that sun loungers and parasols are available from 1 June until 1 September 2018. It was great, Thank you ! No beach towels provided. Parking is extra. Beach lounge chairs are extra. Beach, proximity of Primosten, sea. The bathroom was very oldish and it was a kind of retro feeling. The hotel is very old and so are the rooms and furniture. Renovation needed! Uncomfortable beds! Reception Staff doing their job mechanically, especially impolite one older lady. Swimming pool badly maintained, in much worse condition than on pictures, noone is controlling who is entering premises and people who were not accommodated in the hotel were splashing there all the time. First 2 days of our stay we were coming there to swim and then in one moment we saw on the pool bottom huge poop!! We were warning everyone around us to evacuate and we rushed down to swimming pool desk to report about it. Just one cleaning lady was around and she went to check the poop in the pool. Later on when we were passing by that area, people were still swimming in the pool! And no cleaning or water change was not taking in action!! No towels for guests for the beach, everything on the beach is extra payable (shade, chairs) and the whole beach is on the sun!! Artificial pebble beach- no shells on the beach at all! Extremely cold sea!! Elevators!! An adult with strollers can not fit in normally!! So many stairs, everywhere!! Definitely, not child friendly! We had so many problems with strollers in elevators and carring them on the stairs. Kids club! Nice place but animators are not doing anything in there. Creepy property right next to hotel complex - abandoned old building without any purpose there. Parking - charged 5 euros per day and it is actually finding a place under pine tree, not a parking lot as it should be. Cars are under the sun all day long. Nice place. Very good position of hotel. Nice and polite staff. Next time I am going to book again. It's noticeable that hotel needs renovations on some parts. Staff was very kind and helpful as the last time. The location is perfect. Our room was located almost.pn the beach itself. Food was delicious.